The New Corsa SXi 3 Door looks amazing from every angle. With its strong characteristics and distinctive looks, the New Corsa's presence on the road breaks up the usual monotony of driving. The New Corsa SXi features a signature bar, carrying the new Griffin badge, which stretches across the grille. A re-styled bumper with a wider, more prominent, lower grille gives the car a ‘smiling’ appearance. 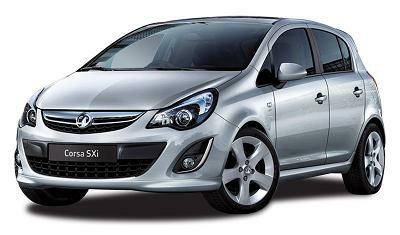 Offer Terms: Vauxhall Corsa 1.2 SXi 5 Door prices based on contract hire or personal car leasing over 48 / 36 Months. Prices based on 10,000 Miles pa - Other terms and miles available. All Corsa car pictures and/or photos and car descriptions on this site are for illustration only.